Philip Brett’s groundbreaking writing on Benjamin Britten altered the course of music scholarship in the later twentieth century. This volume is the first to gather in one collection Brett’s searching and provocative work on the great British composer. Some of the early essays opened the door to gay studies in music, while the discussions that Brett initiated reinvigorated the study of Britten’s work and inspired a generation of scholars to imagine “the new musicology.” Addressing urgent questions of how an artist’s sexual, cultural, and personal identity feeds into specific musical texts, Brett examines most of Britten’s operas as well as his role in the British cultural establishment of the mid-twentieth century. With some of the essays appearing here for the first time, this volume develops a complex understanding of Britten’s musical achievement and highlights the many ways that Brett expanded the borders of his field. 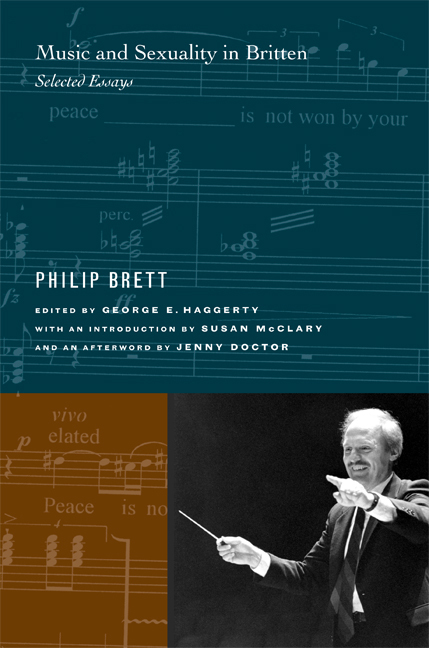 Philip Brett (1937-2002) was Distinguished Professor of Musicology at the University of California, Los Angeles. In addition to dozens of scholarly editions of English Renaissance music and pioneering articles in a wide variety of fields, he is author of Benjamin Britten: Peter Grimes and coeditor of Queering the Pitch: The New Gay and Lesbian Musicology, Cruising the Performative: Interventions into the Representation of Ethnicity, Nationality, and Sexuality, and Decomposition: Post-Disciplinary Performance. George Haggerty is Professor of English at the University of California, Riverside.